Darjeeling: Finals of Rising Star, a mega talent hunt show, concluded in Darjeeling on Sunday. The event was organised Darjeeling police to build ties with local people. Judged by celebrity singer, Amit Paul, the winners of the Rising Star were declared at around 10pm in a packed Chowrasta arena, where people had stayed till night braving rains. Dipesh Rai from Kalimpong won the singing contest in the senior category while Ashya Rai from Pokhriabong won the junior category. In the dance competition, Never Give Up group from Jaigoan stood first in the junior category while Monster X Crew from Panighatta at Chowrasta bagged the first position in the senior category. Vipasna Yonzon from Darjeeling won the instrumental category with her sitar. The top ten contestants in every category won Rs 28 lakh apart from gift hampers. Senior police officers and ministers from the hills attended the event on Sunday. Binay Tamang, chairman, board of administrators, Gorkhaland Territorial Administration said new stars were discovered in the hills. "The Darjeeling police has provided a great platform and we request them to organise the event every year." Akhilesh Chaturvedi, SP, Darjeeling praised the public for their participation. "Over 5,000 participants took part in the contest." Tamang announced that one of the contestants, Diwakar Khawash, who has an eye ailment would be taken to the best eye hospital in the country for advance treatment. State minister Gautam Deb stressed on the need to promote culture and talent of the youths from the hills. "This was a mega show and we wish such programs are held to promote talent of hill youths." Bollywood big names like John Abraham, singer Mohit Chauhan, TV star Karanvir Bohra, hairstylist Aalim Hakim and Yogeshwor Amatya, a singer from Kathmandu, supported the event. Also, household name in Nepali music, Adrian Pradhan and Kaviraj Ghataraj, a well known choregrapher from Nepal's film industry had judged the semi-final rounds. 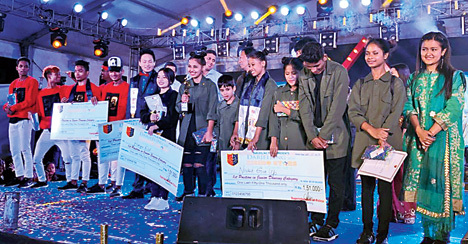 Finals of Rising Star, a mega talent hunt show, concluded in Darjeeling on Sunday. The event was organised Darjeeling police to build ties with local people.